Served from bottle into standard pint glass. Pours clear medium amber, full finger off-white fluffy head. Excellent retention, good amount of lacing. Aroma is slightly bready, w/ light citrus hops. Taste is lightly toasted malt, some bready/biscuity flavor in there with a slight malt sweetness. This gives way to a mild hop finish, with some citrus notes, and a mild bitterness. Bitterness lingers just for a second in the aftertaste, but not much. Medium body, moderate carbonation. Good balance, maybe a little maltier than I'm used to in an American Pale, though the bjcp guidelines say this is a possible characteristic. The Saranac site calls this an English Pale....so maybe it's a little of both ? Certainly a reasonable session selection. Appearance: Nice light copper in color, good clarity, with a minimal head and little lacing. Smell: A bit of toasted granieness, a light floral hoppiness is present. Some malt is there as well. Taste: More of a west coast ale, a hop aroma that is floored with fruitiness, there is also a tinge of dry malt backbone. Up front is a boquet of fresh citrus, orange peel and some spice. The finish is very nice, the maltiness of the brew leaves you with a nice taste on the tongue. Mouthfeel: Carbonation is excellent, not too wet yet not too bitter. The body holds up well on the tongue. Drinkability: Overall this is a delicious pale ale that features more west coast ale characteristics to be considered a "English Pale", yet the maltiness pairs well with the hops. A good brew to go back to from Saranac. Poured a caramel amber clear color with 1-to-2 fingers of white head. Lots of bubbles coming up from the bottom. Great amount of uneven foamy lacing on the sides of the glass. Very good retention. Smelled caramel, honey, wheat, rye, floral hops and cereal. Tasted caramel, citrus hops, pine, floral hips, honey, lime, faint orange, wheat and grass hops. Medium-to-light body. Oily texture. Lively carbonation. Astringent finish. This beer was one of my top-three favorites about seven years ago. Not so anymore, but I will always like this beer. A: Pours a coppery colour with a super dense cream head that hangs around. Awesome lacing. S: Lots of grapefruit. Tons of juicy fruit. Bit of toasty/biscuit malt. T: Nice balance. Super clean. Firm bitterness but not lots of hop bite. O: A really nice pale ale. Very easy drinking. The beer pours a clear copper with a slight head that retains nicely. Good lacing effect also. Pretty nice flowery hop boquet on the nose. Some pungency shines through also. The taste is not as impressive as the nose however. Nothing really stands out. Some caramel malt. Slight bitterness. Nothing really grabs my attention. Pretty average PA.
My second effort at the Saranac sampler pack..what a great idea by the way, I wish more breweries would help us beer geeks out by issuing sampler packs. This English pale pours a tall brownish reddish color with noticeable carbonation bubbles but no head. Its smell lends Kent Goldings hops and a fruity texture with an underlying malt presence. Not too shabby. The taste is rich and lasting with a double barrel blast of hoppy bitterness that rides the length of the sip and continues into the aftertaste. Mouthfeel is clean and crisp, the carbonation isn't as strong as I feared. It'll be interesting to contrast this with the IPA, which is next. Reminds me of some of the old Cooperstown beers, also brewed in upstate NY and using similar hops. That's a good thing. This is a highly drinkable beer..not a work of art but still a tasty, flexible beer great for sessions, ballgames, or whatever. Real nice copper color, with a small, off-white head (which stuck around a while, leaving good lace). Had a semi-sweet, biscuity/doughy malt nose. Quite pleasant! Overall mouthfeel passed the test ok.... Seemed to have a good balance of malt and hops; easy-going malt sweetness upfront, with the floral hops bringing up the rear. Flavorful aftertaste... Prosit! Saranac Pale Ale has a good deal of colour, most of it being orange. Despite having good depth in its tone it has a very light complexion that allows the sun's rays to pass through it completely unrestricted (and even assists them in hammering out some glossy highlights along the way). Its head is substantial and lasts more than long enough. Contrary to what they claim, the brewers don't seem to have used a lot of hops, at least not of the aromatic varieties. But no harm no foul - the malts are pleasant and ample, lending impressions of sweet biscuits and wholesome breads. A vague fruitiness may be testament to the Fuggle and Goldings hops after all (or, perhaps, a proper ale yeast). The flavour isn't what I'd call delicious or anything, but it sure as hell is serviceable. A hefty earthy, fruity bitterness precludes a malty flavour that itself isn't exactly light-bodied. Given some of this brewery's other offerings I was expecting something of an extract taste, 'brew-your-own' quality, but this is more than acceptable for my taste buds. Not to suggest it couldn't use a boost. When a word like 'acceptable' is used usually a phrase like 'too subdued' follows soon after. As noted, this isn't your grandma's Budweiser, not by a long stretch, but it doesn't have the same level of character or appeal as other - namely smaller scale and less commercial - American microbreweries. Saranac Pale Ale is a serviceable, if ordinary, beer and that is likely just as The Matt Brewing Company intended it to be. While I generally don't see the appeal of drinking middling and mediocre beers, every so often a standard, middle of the road pale ale will be called on to do the trick and, for this occasion, that's just what this did. I doubt, however, even another such occasion will warrant a repeat purchase. Pours a nice clear orange amber color with a one-two finger head that quickly turns into a blanket on top of the beer. Lacing is fairly thick as I drink the beer, only gripes would be a bit better head retention (listed in the style). Smells of mostly malts and some hops, earthy and floral, maybe a bit of fruityness too, the overall smell is kind of weak however and no real good aspects dominate. Taste is decent, at first it was a good balance of malts and hops but then it turned into cheap fruity flavor with a weird hop bitterness after taste, the fruit flavor takes away from the beer for me, it tastes like a cheap fruit themed beer after a while but started out good. Mouthfeel I actually enjoy on this one, not too heavy for a pale ale but a good creamyness and coating on the mouth, leaves you with the hop bitterness, good carbonation and no alcohol presence. Drinkability is not the best here, the fruity flavor will ruin the beer after a while, it does however get points for the cheap price, probably won't buy this one again. Pours an orangey Amber with little to no head after rapid disappation. Smells of malt, looking for hops. Tastes odd for a pale, though I noticed this is a Cascade English combo. Maybe identity crisis. Malty bodied kicks it off balance. Finishes crisp. Fair. I drink a lot of this since the closest liquor store to my house has been selling it for the past couple of years for $4.99 a six. It's got a nice hoppiness to it, but is definitely an English-style pale ale. Very flavorful. Appearance  Low head and head retention. Pale copper. Not to lively, kind of flat looking. Smell  Some floral hops not to much going on. Taste  Some floral and piney hops. Hints of apple that I seem to get from these Saranac beers. Sweet malts and sugar. Tiny bit of metallic or astringent aftertaste. Mouthfeel  Well balanced, malty backbone and solid hops. Fairly full body. Drinkability  Decent little beer. Average example of the style. Worth a shot but dont spend too much time seeking it out. Smells of earthy yeast, pine, citrus. Poured golden amber, dark orange with an off white head and decent lacing. A bitterness on the aggressive side for a pale ale, approaching IPA territory. Good body, dry, and fairly sweet as well. Smooth, lingering, and nothing overpowering on the palate. Easily drinkable and affordable...will likely buy again. This beer is slightly darker than typical for a pale ale and as labelled more representative of an English that American style pale ale. Minimal hop aroma leads to a nice balanced malt/hop flavor highlighted by an excellent bitter finish complemented by a malty sweetness. I have never had this beer on cask but I’m sure it would be excellent if a bar ever put it on this way. 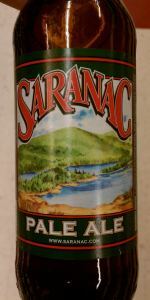 However, this beer is available in almost any Saranac mixed 12 packs and with their wide range of beers this still remains one of the better beers they make. Great around a campfire in the Adirondacks or elsewhere. Here comes the yellow! Nice soft white head and carbonation, decent clarity. Aroma hit those where are the hops and why does this smell like Budweiser kind of vibe. Taste offered up true to form pale malts, but the hopping was disappointing.. High carbonation. Not bad, just a pale ale without enough hopping.